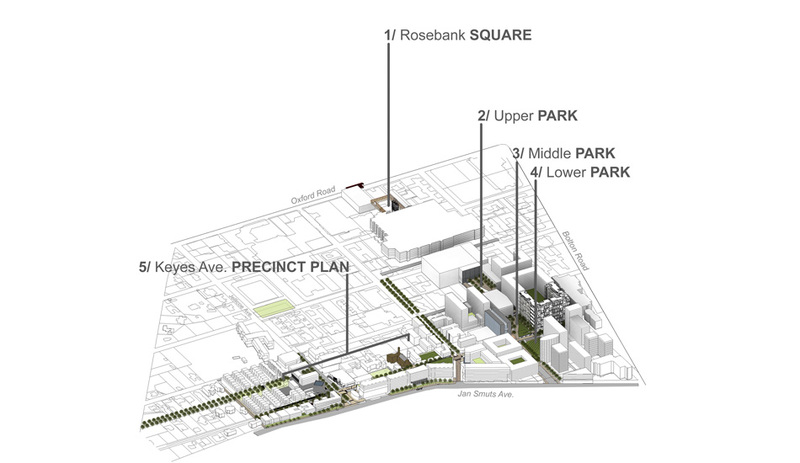 The Precinct Plan for Keyes Avenue has been developed in line with the Rosebank Urban Development Framework and the City of Johannesburg’s Complete Streets Policy. It is the product of an engagement process between professional consultants, stakeholders, City of Johannesburg, Johannesburg Roads Agency and public participation. The focus of the site is Keyes Avenue and its adjacent properties. Keyes Avenue is located on the eastern edge of the Rosebank node. The precinct is bounded by Baker street to the south and Jan Smuts Avenue to the east. 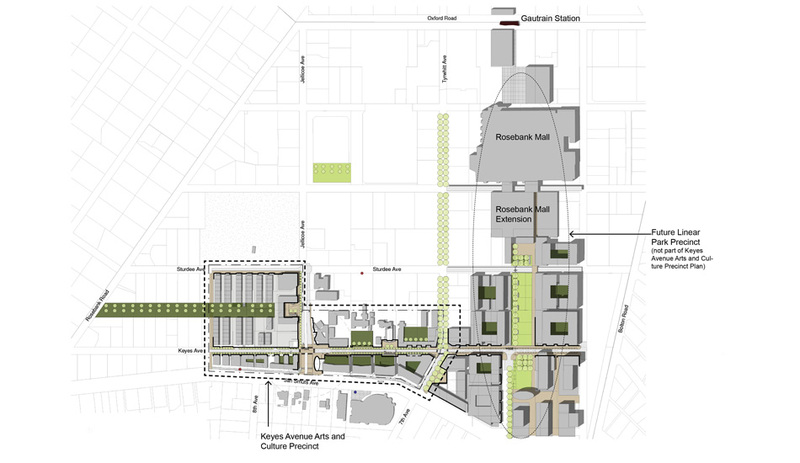 The vision for the Keyes Art Precinct is a walkable, safe, vibrant shared street at the gateway into Rosebank Box. Keyes Avenue is envisioned as a great street to live in, to walk through and to visit. 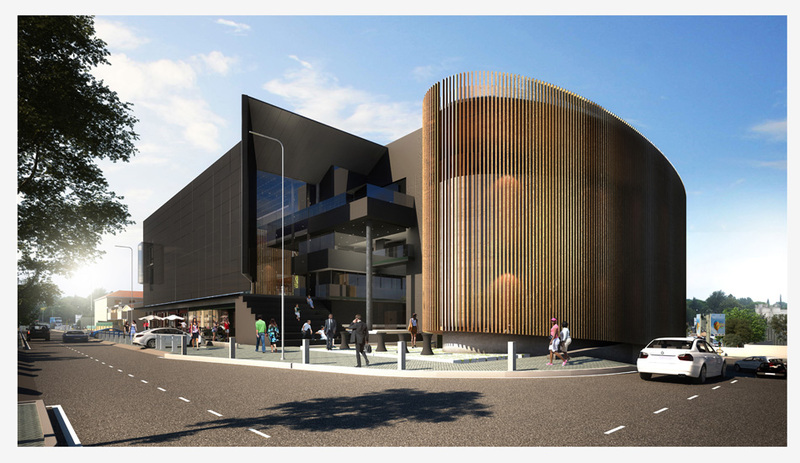 -Active Street Frontages are to be applied to all developments fronting onto Keyes Avenue within the precinct boundary. 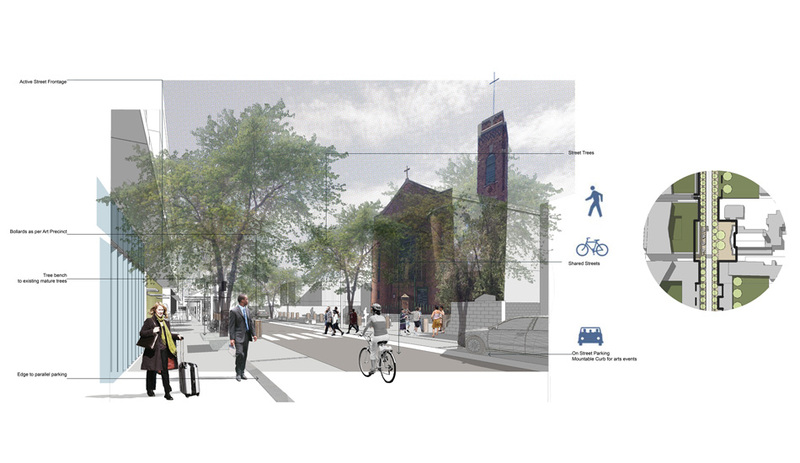 -An appropriate Complete Streets layout for Keyes Avenue with high quality public space is proposed. -Parking facilities to the precinct are to adhere to the guidelines provided. 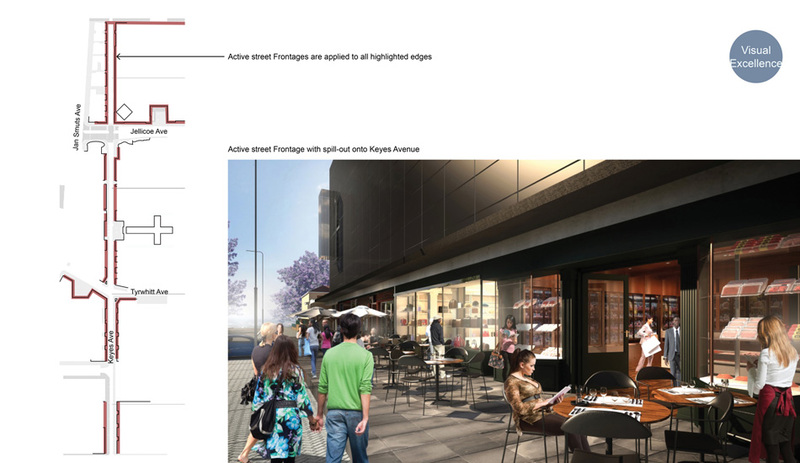 -Position Keyes Avenue as an arts and culture precinct with supporting land uses and events in the precinct. 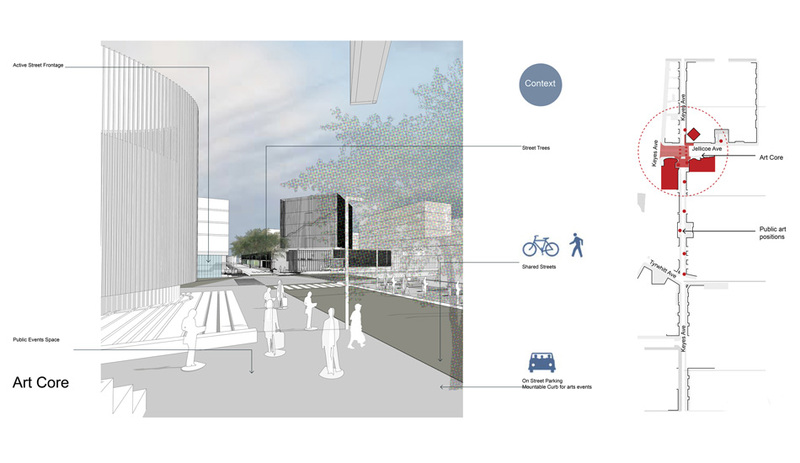 -Movement Strategy:The document illustrates how the development of Keyes Avenue integrates into a greater vision of pedestrian, public space, NMT, public transport and vehicular movement through Rosebank. Keyes Avenue is separated into 3 local precincts each with their own set of guidelines based on the above urban design guidelines. It is intended that these guideline sheets will aid the application process for properties within the designated precinct. 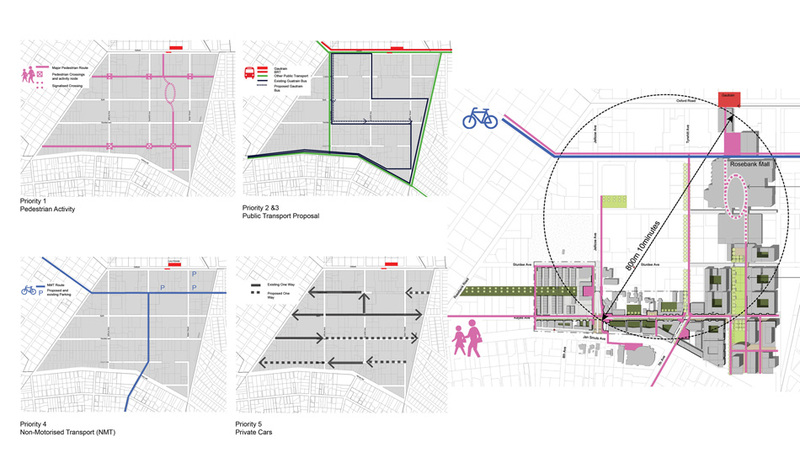 - All development proposals in Keyes Avenue must have active street frontages onto Keyes Avenue. Refer to guidelines in Chapter 6.1. - Upgrade of Keyes Avenue and Tyrwhitt intersection to ensure the safety of pedestrians. - Upgrade of street and pavement surfaces. - Buildings opposite the school and church must not overshadow these facilities. - Re-opening of Church boundary wall to secure a semi-private public space. - The design of the parks is proposed but it is emphasized that further design input is required for the realisation of the park design. - The ROW servitude linking the Park to Sturdee Avenue is a crucial aspect to the success of a safe enjoyable park. 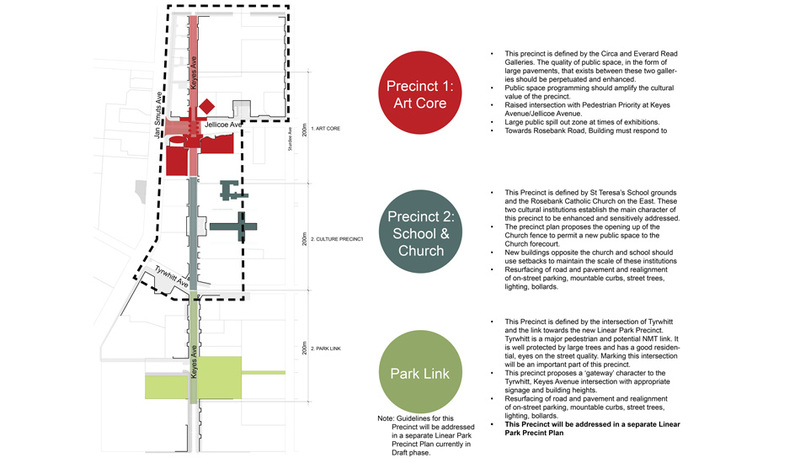 The development guidelines to this servitude are currently being drafted and will form an annexure to the precinct plan. 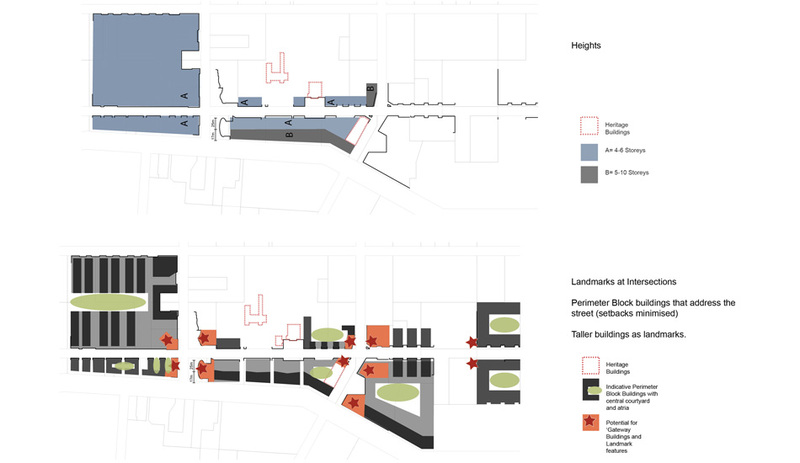 - All development proposals in Keyes Avenue must have active street frontages onto Keyes Avenue. All developments adjacent to the park must have active frontages onto the park.